People returning to homes devastated by wildfires in Northern California are getting ready for the arduous task of cleanup. In some cases, entire neighborhoods went up in smoke. What remains may contain harmful substances, including carcinogenic materials like asbestos. Environmental health expert Geoffrey Plumlee joins Ira to talk about the cleanup process. Plus, pediatrics and pulmonary medicine specialist Lisa Miller discusses the possible long-term health problems that persist long after the smoke and ash are gone. Are you in an affected wildfire area? Read CalEPA’s guidelines on how to safely handle debris and ash. Geoffrey Plumlee is Associate Director of the Environmental Health Mission Area at the United States Geological Survey in Reston, Virginia. Lisa Miller is a professor in the UC Davis School of Veterinary Medicine and Associate Director of Research at the California National Primate Research Center at UC Davis in Davis, California. IRA FLATOW: This is Science Friday. I’m Ira Flatow. A bit later we’ll be talking about the unconscious reasons we do what we do. But first, people in many parts of Northern California after returning to their homes after being forced to flee devastating wildfires. But now they’re faced with another crisis, smoke, debris, and ash, entire houses, entire neighborhoods burnt down, everything from furniture to plastics to paint cans and pesticides stored in garages. All that stuff is in the remaining ash. And the smoke created by these wildfires can be felt not just in immediate areas but hundreds of miles away too. People an hour south in San Francisco have been wearing breathing masks. So what are the potential health and safety hazards after a wildfire? Joining us to talk about this are my guests, Geoffrey Plumlee, Associate Director for Environmental Health at the US Geological Survey in Reston, Virginia, Lisa Miller, Professor in Anatomy, Physiology and Cell Biology at University of California Davis. Welcome both to Science Friday. LISA MILLER: Thank you very much for having us. IRA FLATOW: And I want to mention to my listeners that if you’ve been affected by the wildfires in California, even if you’re not in California, we want to hear from you. Our number 844-724-8255, 844-SCI-TALK. Of course you can tweet us @SciFri. Dr. Plumlee, there were entire neighborhoods, as I say, that were burned down in these wildfires. I know you studied the composition of ash left behind after the California fires in 2007. What did you find was in the debris? GEOFFREY PLUMLEE: Well we looked at both wildland areas where a lot of vegetation had burned and a number of residences where the houses had been completely burned. And we found quite a lot of variability, depending on the age of the house, how hot it burned, and the type of construction. But we found a variety of things like arsenic, hexavalent chromium, lead. There may be some asbestos in them. We also found a variety of other metals and some things like sodium hydroxide, calcium hydroxide, and other hydroxide minerals that are left behind when vegetation would combust completely. IRA FLATOW: So if you’re returning to your home which is a heap of ashes now, you may be mucking around in all the stuff your house used to be made out. GEOFFREY PLUMLEE: Right or the combustion products thereof. And so the key thing is that the state of California, CalEPA has very good guidelines and fact sheets that you can get on the web about how you can minimize potential exposures to those materials and what you can do. So for example, do things to prevent generation of dust. The white ash that’s left behind that has a lot of these alkali hydroxides can be very fluffy and easily disturbed and picked up and breathed in. So you want to wear a high quality N95 dust mask and wear long sleeves, long pants, gloves, eye protection to help minimize any possible exposures to whatever is in the ash that might be there. IRA FLATOW: Dr. Miller, any other health risks from these toxic chemicals that we should know about? LISA MILLER: Well certainly. Folks who have preexisting conditions such as asthma and COPD would be far more vulnerable to the toxic effects, the inflammatory effects of all of these toxins if they breathe it in. So yes, certainly having a mask during this cleanup process is really critical for those individuals. IRA FLATOW: Let’s talk about smoke a little bit. 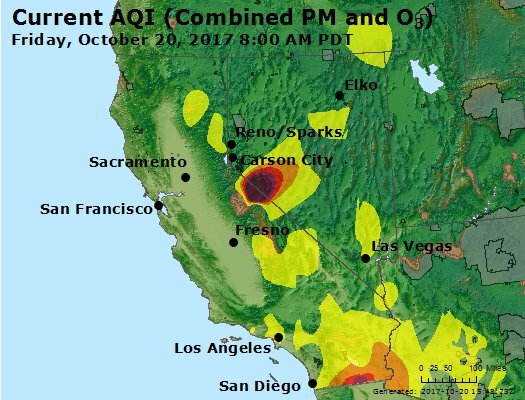 What can happen when people are exposed to this smoke after wildfires, Dr. Miller? LISA MILLER: Great question. So on a short-term basis, there are actually a fair number of studies, observational studies, which have reported increased emergency room visits and hospitalization in, again, those individuals who have preexisting conditions, mostly individuals who have preexisting respiratory conditions. And this is immediately following the exposures with wildfire smoke. What we don’t know a lot about, surprisingly, are the long-term effects of these exposures. The population that is most well-studied, not surprisingly, are firefighters. But even with that group of individuals, the long-term effects have been difficult to document, mostly because it’s just flat out difficult to follow up on some of these individuals. So we don’t know a lot. IRA FLATOW: Let’s go to the phones. Mitch in Cotati, California, hi. Welcome to Science Friday. MITCH: Hi, thank you for having me. So my house is just slightly west of the Pressley Fire, and of course south of Santa Rosa. And all last week it was really evident that there was issues in the air besides just ash of wood, et cetera– you know, metallic taste in the mouth, tinnitus in the ears, and generally just feeling fatigued. You know, it was very much a big deal for us. IRA FLATOW: OK, thanks for the call. Comments on symptoms, Lisa? 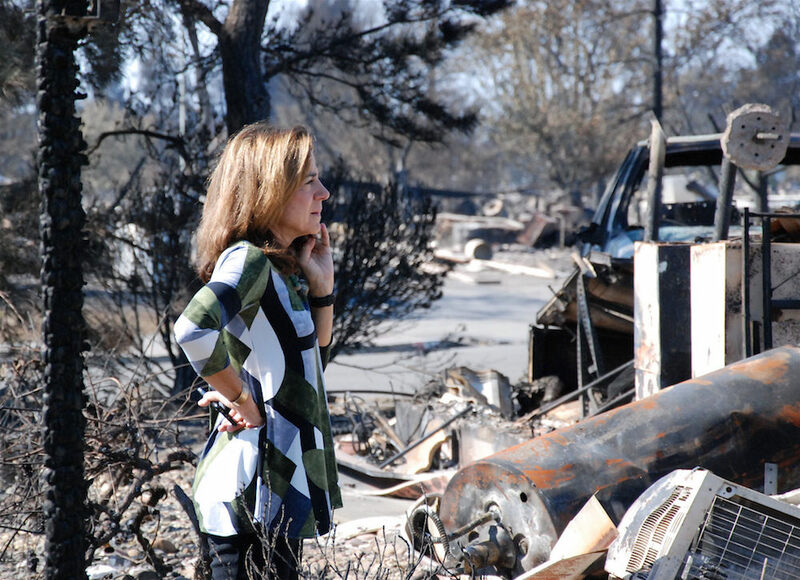 LISA MILLER: Again, his symptoms are very consistent with the types of symptoms that have been reported for previous wildfire events throughout California and throughout the nation. So no surprise there what he’s experiencing. And I’m not a physician, so I should emphasize that. But he’s certainly experiencing the inflammatory effects of these toxins. IRA FLATOW: Yeah, lots of people want to check in on us. Let’s go to Sarah in Sonoma County. Hi, welcome to Science Friday. SARAH: Thanks for taking my call. I have a question. A few friend and I, we live in Sebastopol, so only about 10 miles away. I could see the fire from my front door. And since then we’ve had lots of ash fall of course, as everyone knows. And a lot of us still have vegetable gardens and are wondering what we need to do with that. Do we need to get rid of all our tomatoes, zucchini? And then also what can we do to amend the soil or what can we do to make sure it’s safe for future harvests? GEOFFREY PLUMLEE: Well that’s a very good question. I’m not sure I quite have enough expertise to answer it in detail, but clearly one of the things that we’ve seen is that that airborne ash that’s depositing downwind from active fires at the urban– that have burned a lot of houses in the urban areas can have elevated levels of some metals or things. But the question would be, would that be enough to cause any problems in the vegetation? And that’s something I guess I would advise folks just to consult their county agricultural agents to see. A lot of the properties of natural ash from vegetation actually are nutrients. So calcium, sodium, magnesium, phosphate, are nutrients. The main question would be are there high enough levels of any of the metals to cause concern. And I think that would be a question that would be pretty hard to answer with any degree of certainty. IRA FLATOW: You know, while the wildfires were burning out of control people were praying for rain. And it has been raining in Northern California since yesterday. Dr. Miller, will that help get rid of the smoke? Is that a good thing? LISA MILLER: You know, the chemistry of the particulate matter is really not my area of expertise. But certainly just simply reducing levels of PM 2.5 in the atmosphere would certainly help in terms of reducing health effects. GEOFFREY PLUMLEE: Well one thing I would say that we’ve noted in the past is that when rainfall events happen, particularly in the areas where there are a lot of burned houses, the runoff might have quite a bit of things like arsenic or other metals or debris that could be transported into local streams and might have a potential impact on water quality. So that’s something that would need to be looked at fairly carefully to understand, are there impacts or not, and how much runoff is coming from the burned houses? Typically we’ve seen in areas where burned houses have happened, there’s quite a bit more in the way of potential heavy metals of concern than in vegetation. But that’s one of the things that actually hasn’t really been studied that much. And certainly our hearts go out to everybody in California and elsewhere who have been affected by the fires. But this clearly illustrates some of the things that really need to be continued to be looked at. IRA FLATOW: Well speaking of that, looking into the future, things that you’d like to look into further as wildfires become more intense each year. What are the gaps in our knowledge? GEOFFREY PLUMLEE: Well, so I would basically say understanding more what’s in a house or a building, what goes up in the ash plume and is deposited downwind and population downwind might be exposed to versus what stays behind as a function of, again, more work on the age of the house, the type of construction, how old. Older houses have legacy things like asbestos and lead and some pesticides. So understanding that particularly, unfortunately as more houses burn or buildings burn, and then understanding what the sort of longer-term impacts from exposures to smoke downwind based on what’s known about what’s in the smoke, and then particularly the wildland firefighters who are getting exposed more to materials that are burning in houses at the wildland-urban interface would be pretty important as well. IRA FLATOW: And Dr. Miller, any final comment on that? LISA MILLER: I would certainly agree with his comments. I think one of the major gaps that we have in terms of understanding human exposures and the potential link to chronic and long-term health outcomes is the lack of reliable what we call biomarkers that can actually provide us information as to the amount of exposure and the type of exposure an individual has. We’re really good at using mathematical modeling strategies to come up with estimates of exposure. But actually determining the amount of exposure and the type of exposure on an individual basis is really, really challenging. So I think that’s a major gap that we need to address in science. IRA FLATOW: Well we’ve run out of time. I’d like to thank both of you, Geoffrey Plumlee, associate director for environmental health at the US Geological Survey based in Reston, Virginia. Lisa Miller, professor in anatomy, physiology, and cell biology at UC Davis. Thank you both. GEOFFREY PLUMLEE: Thank you very much. LISA MILLER: Thanks for having us. Sushmita Pathak was Science Friday’s fall 2017 radio intern. She recently graduated from Columbia University’s Graduate School of Journalism and majored in electronics and communication engineering in college. She sometimes misses poring over circuit diagrams. In her new book ‘Big Chicken,’ journalist Maryn McKenna uncovers how the overuse of antibiotics created the current chicken industry. Scientists still don’t know when or why the moon lost its magnetic field—but it was at least a billion years later than they thought.